Upgrading to a convection oven provides an effective and easy way to cook a variety of foods at lower temperatures and shorter times, compared to standard radiant ovens. Because convection ovens cook by moving hot air around the inside of the oven, food cooks faster and cooking results are often more tender and flavorful. 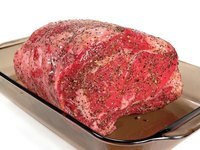 Cook meat in a convection oven and prepare to enjoy a moist and tender meat entree. Set the convection oven temperature to 25 degrees less than the recipe recommends for cooking the meat or 25 degrees less than you would ordinarily cook the meat. For example, if you would ordinarily roast a beef roast at 375 degrees Fahrenheit, reduce the heat to 350 degrees. Place the meat onto the rack of the roasting pan. By using a shallow roasting pan, you ensure that the convection air circulates thoroughly around all sides of the meat, including the bottom. Do not cover the meat. Insert the instant-read thermometer into the meat to enable you to monitor the meat temperature and remove the meat when it finishes cooking. Bake the meat for approximately 30 per cent less time than the time recommended for a conventional oven. Remove the meat from the convection oven when the meat reaches the proper temperature. Using a roasting pan with a bright aluminum finish will result in evenly roasted meat. Searing meat is not necessary when you cook it in a convection oven. The circulating oven air sears the meat, sealing in juices and making it tender. Basting meat is not necessary when you cook it in a convection oven unless your marinade is sweet. In this situation, baste the meat during the final hour of cooking to create a caramelized outer edge.